* Please note, I do realize that various cultures and disciplines use different names for the parts of swords. The descriptions below are to be used as basic guides for users of this site. You say your swords are constructed with a full tang. Could you explain what is meant by tang ? RS – The following description refers to wooden sword or knife construction. The tang of a blade is the part that goes into the handle. When viewing a sword that is constructed with only a partial or hidden tang, you can see that the tang is pegged or inserted completely inside the handle (you can’t see how big or small the tang is). 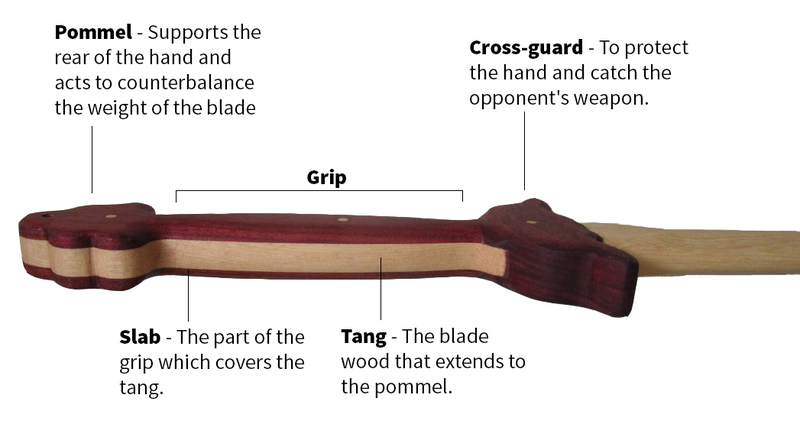 When viewing a sword constructed with a full tang, you can see that the tang is sandwiched (laminated) between two handle pieces, called slabs. In this way, it is highly unlikely that the blade will loosen, crack, or break off where it meets the guard and handle. How do your wooden swords hold up to contact or sparring drills? RS – Raven Studios’ wooden training weapons can be used not only for forms and solo technique practice, but they are also very well suited for partner training. I designed them to be durable as well as comfortable and well balanced. They are fashioned from the most impact resistant woods I can find. The swords are constructed with a full tang and the guards are securely locked in place and can not slide down the blade or handle. The grips are shaped for comfort and control. All training swords are finished with a linseed and tung oil blend, which penetrates into the wood to provide a tough surface (much stronger than a surface treatment such as varnish or urethane). Then the wood is buffed with a paste wax for even more protection from the elements. Having said all of this, with contact, any wood is still subject to denting, splintering, or cracking etc. Even wooden baseball bats (traditionally made from ash and maple) have a limited life time. Keep in mind that any sword (wood or steel) used “baseball bat” style, directly against an incoming force, will have a limited life as well. My goal is to create a training sword that will both accompany you during endless hours of martial arts training and be your cherished companion for many years to come! How do I determine which size Jian is right for me? RS – Determining the proper length of a jian varies from school to school. Your martial arts instructor is the best person to answer this question because different disciplines prefer different methods. For example, some say the length of the entire sword should be equal to the distance measured from the floor to your navel. Others prefer the following method; stand with your arms hanging at your sides and have someone measure the distance from your wrist to one inch above your ear and the “blade” should equal that distance. Still others believe that since historical sword blades averaged about 29″ in length, that is the length that should be used regardless of the user’s height. The preferred method however, should be determined by your martial arts instructor. Can you explain how you measure the various parts of your swords, hilt length and POB for example? RS – The blade length is measured from the tip of the blade, to where it starts at the blade side of the guard. The hilt length includes the guard, handle, and pommel. It’s measured from the end of the pommel, to the blade side of the guard. The point of balance (POB) is measured from the blade side of the guard, to the balance point. The blade width is measured where the blade meets the guard. The handle length is measured from the handle side of the guard, to the handle side of the pommel (unless otherwise indicated). Do you make custom wooden swords? Do any sword distributors carry your products? RS – A number of sword distributors have requested to carry Raven Studios products and although I truly appreciate the kind offer, I have had to turn them down. Raven Studios products are not mass produced, they are constructed per order. I want to ensure that each customer receives exactly what they want and I personally work with each one to reach that goal. I believe having direct contact with customers is essential to the success of Raven Studios. You've changed your wooden dummy ordering process. Can you explain the process? Also have you stopped making the dummy stands? RS – A waiting list has become a necessary part of the wooden dummy ordering process. I am able to make about 6 to 7 wooden dummies per year. There is usually anywhere from 3 to as many as 15 people on the waiting list. When I am ready to start the next jong I will contact the person at the top of the list. If they are ready to place their order, I will arrange for payment and start their jong. * Please note – I no longer make dummy stands. Since there are a few stand manufacturers on the market and making the dummies is my specialty, I am able to make more dummies per year if I don’t make the stands.